This guidebook has 30 routes for mountain walkers of all abilities in Southern Catalunya. 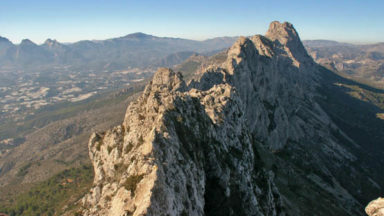 The routes are in 3 national parks between Barcelona and Valencia; around the River Ebre: the els Ports massif, Serra de Cardo and the Serra de Montsia, including the immense limestone crags of the Parc Natural dels Ports overlooking the Mediterranean. A dramatic coastal mountain region of remarkable natural beauty and diversity, Southern Catalunya is mysteriously unknown outside of Spain. 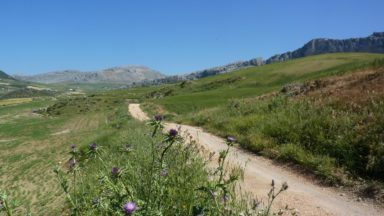 In the mountains, limestone crags with well-established paths overlook the orange and olive groves perfect for day walks with a long-distance path that runs along the coast for those wanting to walk a little further. 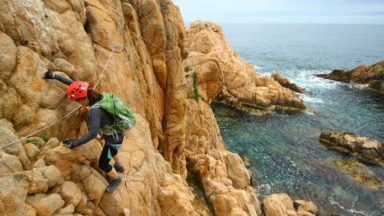 The walks all vary in difficulty, from coastal trails to hands-on scrambles, but all are clearly marked at the start of each route for route finding, scrambling and exposure. The region has not been greatly visited by walkers from the UK, as it is not obvious from the general tourist maps that it even has mountains yet with its benign winter climate it is ideal for walkers from October through to May. These day walks boast spectacular scenery including salt and freshwater lagoons surrounded by wildlife, high mountainous regions as well as stunning coastal trails. www.la2deviladrich.cat/public/en, which has an English language option. The Institut Cartografic de Catalunya produces maps of the area at 1:50,000, which can be bought in the UK. The scale is inappropriate for walking but the Baix Ebre (9) and Montsia (22) sheets are useful as detailed road maps. There is also online access to 1:10,000 maps at www.icc.es, but these lack essential footpath information. After ascending the scree the path turns left to climb for some 10m towards the base of some undercut cliffs before turning definitively right onto a clear path. The way now becomes increasingly hemmed in by cliffs and pinnacles until it narrows to a cleft, with two wooden ladders leading up over the top to provide the only exit. 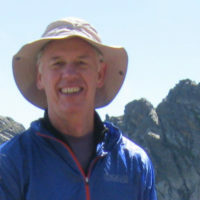 The guided walking, birdwatching and other services previously provided by Ebrotours have now been transferred to Walking Birder, which can be accessed at www.walkingbirder.com. 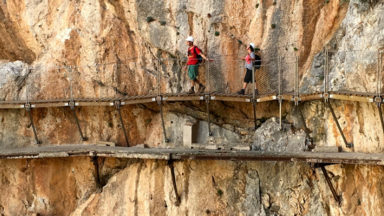 A new start is needed for these walks now that the original track to Mas Torrat has been fenced off and it is clear that walkers are no longer welcome to follow the barranc route directly but must make a detour to join the route higher up. The same alternative should also be used for Walk 25. Leave the car park on a broad track, signposted for the Coll de l’Ametleral, ignoring a track leading to the right. Take a path leading up to the left after one minute, following red and white GR7 markers and blue stars, to reach a second signpost 5mins later. Bear right onto a broad track, still on GR7 and continue straight on past another signpost until, some 25mins from the start, yet another signpost indicates the direction on a small woodland path climbing up to the right for the Pla de l’Hedera. After 10mins the path joins a track and a right turn (Pla de l’Hedera) is indicated. After only a few minutes the track bends acutely to the left and the route continues straight on, on a small path. Some 8mins later, at a junction with a marker post, the original path joins from the right, having climbed up the barranc directly. Continue straight on for a few more minutes to reach a T-junction marked with red paint and make a left turn to continue the route as described in the guide. A new parking area has been built about 500m before Casa de Carvallo, just before the road has a big kink south. The workmen are not finished yet, but there are already “no motor traffic” signs and the foundations for a barrier to stop vehicles going on to the Casa, so all the walks will be a km or so longer. Many thanks to Peter Gorvett for this information. Instead of carrying straight on past the ‘No-entry’ sign as described, turn into the rough track which joins from the left. After approximately 200m there is a clear footpath on the right, marked by a post with a direction arrow and a cairn. Take this path and follow it until it joins a broad track. (This is the GR7). Turn right and complete the circuit as described in the guidebook. I found this guide easy to read and the concise route descriptions easy to follow. 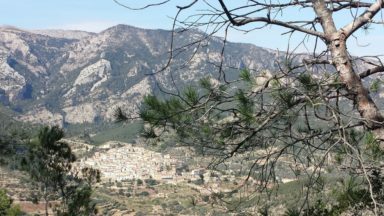 Southern Catalunya cannot be recommended highly enough for a winter walking destination and this excellent guide should help make this area accessible to walkers from the UK. This guide with its find selection of walks and excellent diagrams should inspire many to explore this unique and wonderful area. 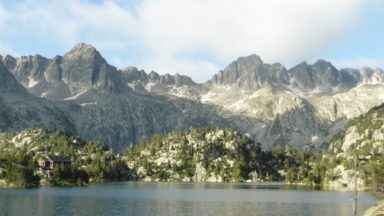 Mountains have been an essential counter-balance to busy academic careers for Philip & Vivien for many years and the opportunity to live among mountains was one that could not be resisted. 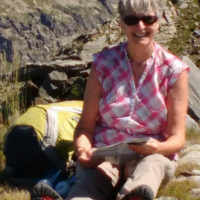 For many years it was weekends in Derbyshire, long weekends in Snowdonia, weeks in the Lake District and summer holidays in the Pyrenees, Alps and Rockies that provided the antidote to academic life in the midlands. The discovery of a little known winter walking area in Southern Catalunya in 2005 brought a new project.